Welcome to the Chihuahua Club! Each week I will send you our weekly newsletter. In our newsletter you will find adorable chi photos, tips, facts and more. I will also include links to our newest blog post so you will not have to worry about missing a thing. Every once and a while I will also send you emails about any new events, opportunities or freebies that I think you may just love. First, make sure you are getting my emails. This is important! If my emails aren’t getting to you you will miss out on all the great information I have to share. Take just a few minutes to whitelist all emails from “I Love My Chi” and cathy@ilovemychi.com. If my emails are going to spam, simply drag them to your inbox or mark them “priority”. Next, be sure to download your printable Pet Emergency Info page. It’s a page to keep your pet’s details, phone numbers and contacts in case something happens and you need it. Print it out, fill it out and tape to the fridge for anyone who will taking care of your pets. Enjoy and feel free to email me at cathy@ilovemychi.com if you have any questions, concerns or if you want to enter your chi for the Chi of the Day on Facebook (I need a clear photo of your pup along with their name). I love my 5 babies. I have mommy,daddy, and three daughters. They are the best. They are always there and make your day.I always have a lap full. I bet they keep you quite busy Chris! Thank you for letting me join the Club…. Thank you for joining us Leann! Thank you for giving elderly and special need chis a home. We need more people like you. Hi Liz, thanks for joining us! As for dog food, one that just about every dog likes is Royal Canine chihuahua. You can find it at PetSmart, PetCo or online at Chewy.com or even Amazon. Personally I feed my dogs a fresh home delivery food called Ollie and have also used The Farmer’s Dog with good results. I am thrilled to find a Chi group! Why did I wait so long entertained by cats?? I have two adorable chihuahuas but one just came down with seizures. On meds now but still worried. Of course you are worried. I was too with my terri-poo and even though he lived to a ripe old age of almost 19, I still got upset every time he had a seizure. We own 10 beautiful chihuahua’s. We love them so much they are our kids now. Our children are grown now. Wow Mary! 10 chis! I’m jealous. Bear is adorable! We have had Chihuahuas dogs for all 52 years we’ve been married. Right now we are owned by three females and one male. They range in age from three years to 11. All spayed n one male whose neutered! They are very protective of each other n me. They love our older grandkids but are very nervous around little ones. Our youngest great grandkids are babies n tend to grab our fur babies if I take my eye off them.our kids think our pups should be punished for getting pinched or ears n hair pulled. I refuse as they react to being kicked at or hair pulled. We told them no punisentsc for defending themselves. Babes-toddlers can be taught to be nice to tiny 2-3 pound pups! What do you say? I agree with you Mikki. It’s best to keep tiny tots away from the pups but if they are hurting them, then the dogs have a right to defend themselves. I started when my kids and grandkids were babies to be gentle by guiding their hands to gently pet a dog and say “gentle” as we do it. Eventually they catch on, except my 3 year old grandson who is developmentally delayed and on the spectrum. I’m still working with him but my dogs have pretty much learned to stay away from him when he is here. And I never leave him alone with them. My chi is no longer having seizures since I took him off nexgard but he is on very small dose of phenobarbital. Vet wants to cut him down off meds soon or almost down to very little. I have heard of those type of flea meds causing issues like seizures. I’m glad they have stopped and your vet is going to cut back on the seizure meds too. Thanks for updating us Sandra. Sandra , try Pet CBD , Cbd is good for seizures, I have 9 Chi, Chi mix, and also a son with seizures, read up on Cbd for pets. You can get it a lot of places, and not trying to make a sale but I just opened a site for Cbd, it’s called hemp gods miracle, and I carry Cbd hemp for pets, and use it on my own dogs, I can not say it will help or cure your baby, but hemp is know for helping with seizures., so if you would like to even just get information from my site, please go ahead, http://www.hempgodsmiracle.com, the products listed give you information. I hope your baby is ok.
You are very welcome Charles. Glad you could join us. And so glad you gave your fur baby a loving home that she deserved. 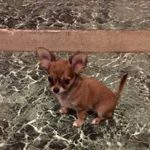 What kind of dog do you feeding baby chihuahua… It’s seem like my 4years old baby peanut is allergic to wet chicken. I try him on royal cannin mini kibbles he did not want to eat it’s. Keep on itching alot he weight9lbs 9ounce and advice greatly appreciated it your help l give him Nequard for flea and ticks. It sounds like Peanut has a lot of allergies so you may need to start making his food. You could see how he does on eggs. Also add a little beef and some veggies such as green beans, carrots, pumpkin. Or if you really rather buy premade, you may want to try what I’m using for my dogs. It’s human grade and they ship it to you. They have different varieties so you can skip ordering the chicken. I feed my Chi Science diet. It was recommended by his vet. He weigh 4.6 lbs was 3 years old Christmas eve. He goes with me almost everywhere. His name is Rascal and he lives up to the name. Rascal is a cute name Shirley. Peanut is a cutie Mabel! Thanks for joining us. Happy holidays to all Chihuahua pet owners. My name is baby peanut l am four years old my birthday Feb 23_2014 my Mommy got free order lintbell b yumove chewable for hip and joinst. I love seeing all the Chi photos and keeping up with the adventures of the Chi world. My life is definitely better with my own Chi……. PLEASE get a rescue they are so in need of a home. I hear Chihuahua are #1 in kill shelters. Any chance you would consider 2? Olga, here’s a breed specific rescue page. You can easily click your own, and any other state you’re willing to travel to. Chi’s are 2nd in euthanization only to pit bulls/ bully breeds. If you’re simply looking for a companion please do rescue! Bless you Yvonne for rescuing your senior chis. They are often hard to adopt out. That is a shame Sandra. We’re so glad to have you here Trish! 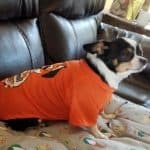 My chi Chikito was attacked last night by 2 pitbulls. He is in pain and traumatized. Thank God It wasn’t as bad that I thought. He is resting comfortable. The pain killer is helping him with pain and helping him relax. Oh wow! I’m so sorry Wanda. I’m glad it wasn’t too bad and that he is resting comfortably. Did your Chi have to have any stitches? Two pit bulls can do a lot of damage. Keep her on your lap as much as you can, the best way to help them feel safe and relaxed. Hope your Chi gets better. This is my chi Poco and he is awesome. I don’t see the photo Kathy. Glad to have you with us Lisa! BluePhelps is beautiful! I know you wanted her to be Chi of the Day. I have her scheduled for the 15th. I’ll send you the link when the post goes up. Hi Pluto is about 3yrs old. I got him around Thanksgiving so his birthday just passed. We’d really love to get him to be chi of the day!!! But I keep having trouble posting his picture on your fb page? Hi Michelle, I have Pluto on the list and I’ll send you the link when it’s up. I had to share this pic. He snuggles with me all the time but today decided the blanket wasn’t good enough and went down my shirt into my sleeve. Sorry, but I thought it was so funny. It is funny…mine do funny things too.. This my Abby!! Believe it or not my daughter found her in the trash when she was about 10 weeks old. Never thought I’d be a chihuahua lover….but I love thus girl! Can’t get enough of her! She is 6 now! This pic looks like she is singing…but really just eating her carrot!! Oh wow Lori, that’s so sad someone would throw away such a sweet little thing! I don’t see a photo Tammy. Such Cuties! You are very lucky Chelsea! Wondering how to register my sweet little Casey for Chi of the Day contest. Catherine, the best way is to email me a clear, photo of Casey and include any info you want to share about him/her. It takes up to a month to get on there but you will be emailed the link to it when it goes live on Facebook. Hi I have 7 baby some r old some r baby’s but thay r all wonderful and I love tham all very much my days would not be the same without all my fur baby’s no matter how bad my day gets at work when I open that door and all my baby’s come running to me it’s all gone thanks for letting me be a part of this.dugger is my oldest 21 years old then cupcake Oreo patches chopper bumper curator.ps how do I get there pitchers on here. Thanks for joining us Diana. I don’t know how to add a photo from your phone but if you are on a computer, you should see a button right below the black “Post Comment” is a button that says “Choose File”. click that and upload your photo from your computer. Thanks for letting me join. I have 3babies and I love them with all my heart. You’re welcome Michelle, and thanks for joining! That’s a great photo Clare! I just joined so let’s see if this works on my phone! Will try to send pictures of my babies! This one is Sandy! She just recently went completely blind. She is 9 yrs old and is a rescue! This is my soon to be baby i’m naming her Joy! She is 6 wks old today and this picture is at 4wks old! She was born on 11/28 the day after Thanksgiving and my birthday! Last but not least this is Katy! She’s not a chihuahua but a pomeranian but I couldn’t leave a family member out now could I? I don’t see a photo for any of your comments Diane. Sugar Kisses is a pretty girl Jennifer! Hey try a Rescue they don’t cost as much and they make great family pets. Plus you will be saving their life. Think about it. This is my other Chi his name is Isi and he’s a deer chi ^.^ He loves to run and play fetch. What a handsome little man Isi is! I was wondering how I could get one of my Chi’s to be Chi of the day please ? Good for PeeWee! He’s an inspiration. Thank you so much for letting my babies and I join your group. I have 3 chi’s and another coming soon that I adopted from a shelter. I love them so much they are such a joy to have. My Attie Girl has my heart, I got her because she has a attitude that she is the boss and she dokesnt mind letting you know about it! She sounds like a Chi Christy! Thanks for adding me. I have a Chihuahua I found on the side of the road. We had her for two days and she developed Parvo. For seven days and nights my hubby, my daughter and I gave her Pedia lite every 30 minutes and brought my sweet little Sophie back from the jaws of death. Now she is COMPLETLY spoiled. We love our little chi-chi! Wow, she’s lucky you found her at the right time Debbie! We are excited to be joining your website!! My Chi’s bring me so much joy!! And we are excited to have you here Evelyn! Love your little Chi! I just joined & I’m going to love it. I love Chihuahuas. Several years ago I had a pair that I bread. The female couldn’t have anymore puppies because of a calcium deficiency. My daughter in law took her. The male I had for 14 years before having to put him down, he was the love of my life. Just adopted a puppy from a shelter, hes beautiful. His name is Harley, spitin image of my Poncho. Hi! So glad I found this forum! I have a 7 year old long hair Chi named Poohchi. My companion and my baby, she is loving and special. Adopted from the pound three years ago. So great you and Poochi found each other Grace. We also were not Chihuahua people until we were a foster fail for a sweet tan chihuahua we named Pico. He was in a shelter in Rockport Texas last October. He is so amazing we got him a little brother – De Gallo. The amount of love a chihuahua gives their owner and the bond they develop is so beautiful. It breaks my heart when I see a chihuahua that is in a shelter situation. I would bring them all home if I could. I’d bring them all home too if I could. Your fur kids are adorable Rhonda! Hi everyone!! Thank you so much for letting my Chi and I join!!! So excited that there is something out there like this for people like me 😊 you don’t know how happy I am. This is my baby, my angel, my saving grace, Bambi. She came from a hoarder from South Carolina back in oct 2010. We got 31 out of 180 Chihuahua mixes from one house. She was about 10-12 weeks when she came up here and didn’t even weigh a pound and a half. nothing but bones and was biting everybody except me for some reason. So I took her home to foster and well, I am officially hers the following January lol. My boss new what she was doing. She does rescues. I helped when I groomed there. Was the best thing ever. Oh and chis can most definitely be service dogs. She is mine. She has saved my life a couple times because of it. I always said I would never have a Chihuahua and I would never dress it or anything like that LOL. But then 10 months later this little girl came into my life with hardly any hair. Then customers of mine started Giving me clothes for her. Then just a couple weeks after I brought her home my last dog which was a German Shepherd past from kidney failure. I think she was waiting for someone to come be with me. She was a great dog. she was over 16. Her name is Sandy. And she loved little Bambi. I don’t dress Bambi all the time. Just for special occasions and events and when she gets cold LOL. She like to get into her sweaters. Forgive me this is so long. Sandy sounds like she was a great dog too. We recently lost our german shepherd mix at 12 years old. He had so much personality and I really miss him. He loved my Lucas too. They were best buds. Cathy, I am so very sorry for your loss 😢. I really pray and hope he didn’t suffer and I pray he rests peacefully and happily in heaven with the Lord. He’s waiting for you at the rainbow bridge. I just lost my bearded dragon, my grandfather and my goat all in less then a month starting June 8th. I know they are all waiting. And I miss them very much. I know how you feel. It’s not easy. But your little one Lucas is here to help you through it🙂. Thank you again. Thank you. And now I have my little Lucy too and that helps a lot. You’ve had a tough summer! I’m so sorry for your losses. Yep she is. Lucas is a chi/yorkie/mini-pin mix. Here’s a photo of them on my bed this morning. Lucy is on the left, Lucas on the right. Oh my gosh they are so cute. Don’t know why but this won’t let me put my name. I see was saying I was anonymous. Buts it’s April. When I go to put my name in it will only put in the il. Oh well. Anyway they are beautiful and handsome!!!! I think there is a bug in the comment software I’m using because someone else was having the same issue this morning. Ok. Thank you. It was ok earlier when I posted about Bambi. Oh well. Technically. Thank you for joining us Faye! Thanks for adding me! My Chi is 19 – yes nineteen, she turned 19 in April and is going strong. She has one tooth so she is fed senior can food daily and a half cup of her favorite dry kibble. Thank God she is doing so well. She does not want to be bothered so she is kept in a soft warm doggy bed with her own house. We carry her out and in to do her business, she is incontient but at her age its not a problem. I just keep her and her doggy area clean and dry. I have stopped her shots three years ago and only use natural flea drops on her. I am amazed and happy she is still with us. She looks great for her age! You must be doing something right for her to reach 19 Lin. URGENT & IMPORTANT My four month old Jerry is supper aggressive. He always run after people, even familiar people to bite them or scare them to a point where either parties will get hurt. What can I do? He is ANTISOCIAL I feel. Yeah he is aggressive and it’s something you need to nip in the bud before he gets older. This is all part of small dog syndrome. He thinks he is the king of the house. I’d look for a good dog training program (at the very least, enroll him in PetSmart or PetCo’s puppy training class) just so he learns he is not the boss. My Pup may have cancer. And I can’t afford the surgery. I don’t know what I should do there are no vets that take payments. they all want to cash up front. Is there someone to turn to does anyone know? I’m so sorry Debbie! That has to be heart breaking. How old is your chi? Thanks for joining us! I’d love to be a member of a chi meet up group like that! HI my little Chi is 7 years old. He had a canine tooth that was a baby tooth and never came out. Today his snout was swollen and found out the tooth is now infected (abscess) they say I should have it removed surgically. It will cost around 300 dollars which I would have to use a credit card and he would be put under and it would be all day and i could pick him up after work. I am scared of how risky it may be. My dog has always been healthy and I’m looking for advise about having the surgery done. I am giving him oral antibiotics for now and softening his dry food which he ate the whole bowl once I moistened it. Can anyone tell me if their Chi has had surgery and if it was fine? I am really worried about this and trying to decide what to do. There is a risk to the surgery Jean but there is a greater risk if you let it go and do nothing. These kind of infections can be life threatening. The antibiotics will help but not long term if the tooth isn’t removed. Let us know what you decide and how he is doing. Good luck. I’m praying for your little guy! And it’s important to buy toothpaste from your veretinary..we’re do you live.. I always use a harness for my gorgeous Inca because chihuahuas are very small and fragile! She is 11 years old now! Inca is a beauty Margaret! Do you know what he’s allergic too? Hi, this is my Kiki, 3 months old, I cannot tell if she’s an apple or deer, I would say a mix. What do you think? The photo didn’t come through Jelena. We got our little girl, Zoey, at age 6 months. She is now 9 months. She is absolutely mean to anyone around her except for my husband and myself. I want her to be social because we like to travel. What can we do to make her quit growling and snapping at anyone that comes hear her. The good news is she’s young so you may be able to turn this around. I’d get her in a puppy training class (PetSmart and PetCo has them) as soon as possible, Just being around other people and dogs there will giver her some more socialization opportunities and the training will help. I have always been a pug lover! My Daughter recently rescued a Chihuahua puppy, she is such a love! I would like to Adopt one , not having much luck! Lead me to a place to find a little Chihuahua! Were you trying to show us a photo of Willow? It didn’t come through. My penny has a cloudy greenish blue tinge to his eye’s, also he rubs his eye’s alot. Is this serious? It could be Nuclear sclerosis which isn’t a big deal and doesn’t hurt the dog’s vision or it could be cataracts or glaucoma. Your vet could tell you for sure. Since he’s rubbing his eyes, he could have dry eye which can be treated by eye drops. Again your vet will need to diagnose this. Oh my gosh!!! No wonder my poor Missy was SCRATCHING herself so badly. I just found 3 fleas sucking her blood there were arround her vaginal area. Kill the 3 bb,and I used cotton buds dump in coconut oil. I not going to sleep tonite. I been watching her like I did with my babies (twins 45) boys and a girl 43. Oh my poor little angel,just been to the vet for VACCINATION last week,he saids very healthy,about her rush he didn’t give me nothing,saids Chihuahuas having skin problems all the time. I do vacuum every second days my unit,and don’t have carpet. She plays with my friends dog shes a sausage one. So,Missy may catch it of her. Who knows. I’m so worries she was shaking because,she knew I was upset but,no with her. Shes 3 years old,chihuahua x Papillon. So,breeds calls Chion. Yeah fleas are no fun but it’s something most of us have had to deal with at one time or another. If you found 3, there may be more around in your house. One way to tell is plug in a night light in an electric outlet that is low to the ground. Place a shallow pan of soapy water underneath the night life. Be sure the night light is the only light on overnight and check the water in the morning to see if there are any fleas in there. I am going to be taking in a 1-year-old chihuahua. She is not trained at all yet. Do you think it will be very difficult to train her? Do you have any tips?